LANmark-7 23/1awg SU/FTP Marine Grade • DNV | Belcom Cables Ltd. 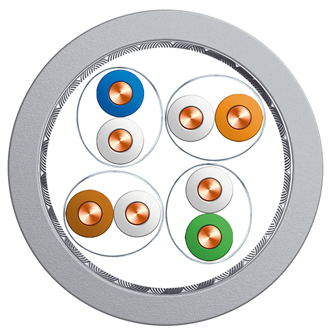 The LANmark-7 maritime cable supports all current standardised applications requiring Cat.7 bandwidth. It will support low bandwidth applications as well as state of the art data applications. for installation on board ships and sea movable constructions. Oil resistant - IRM 902 (IEC60811-2-1) : 4 hours/70˚C. DNV approved. Use : 10/100/1000/10GBase-T; Cable sharing, CaTV (862 MHz), Industrial ethernet.